I’ve talked about how great my roommate is before. Well a lot of nights as Em and I are finishing up our homework for the night we’ll take turns playing fun throwback songs. We’ll go back and forth taking turns that remind of our childhood in the late 90s and early 2000s. Most nights it turns into a dance party of 2 and instead of going to bed we’ll be up singing our hearts out and dancing (embarrassingly) around our teeny tiny dorm room. Our poor next door neighbors. Our poor snap chat friends. It’s really a sight to see. I remember drama filled high school dances, the extremely awkward middle school dances, and how can you forget the holiday themed elementary school dances?! I also remember having the most fun at the dances where I was completely myself and danced like a complete fool with a group of friends because I didn’t care what anyone else thought. Those were the best dances. That’s what it’s like when em and I are dancing around in our pjs at 1:30 in the morning. It’s a complete judgment free zone. 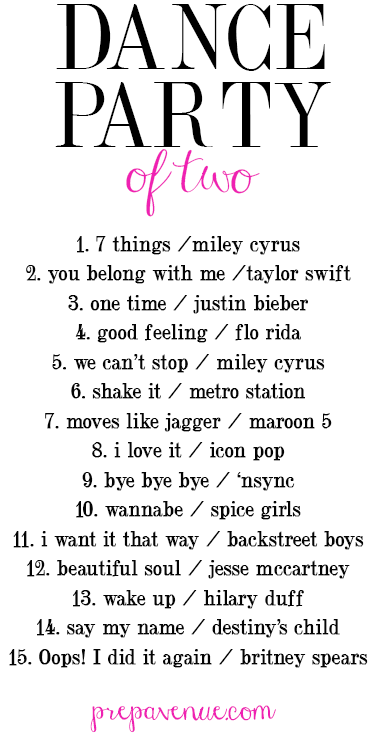 Anyway I thought I would share with you some super fun throwback songs that are perfect dance party songs that are often played during these spontaneous dance parties! What are your favorite throwback dance songs? Shake It & I Want It That Way definitely illicit some hilarious dance moves from me! Love this list! This brings me back to my middle school dance days, especially with the Spice Girls! Having a dance party sounds like an awesome way to de-stress after a bad day! I know school can be super stressful, I find it really relaxing when my roommate and I stay up late talking and laughing like we are middle school girls. This is so great! I would definitely jam out to "Too Little, Too Late" by JoJo! These songs are all throwbacks and I love it!! Brings back the awkward school dances!